Llandudno (/θlænˈdɪdnoʊ/ or /lænˈdɪdnoʊ/; Welsh pronunciation: [ɬanˈdɨ̞dnɔ]) is a seaside resort, town and community in Conwy County Borough, Wales, located on the Creuddyn peninsula, which protrudes into the Irish Sea. 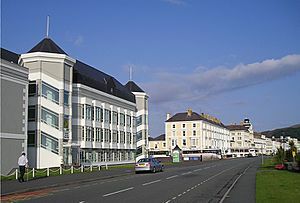 In the 2011 UK census, the community, which includes Penrhyn Bay and Penrhynside, had a population of 20,701. The town's name is derived from its patron saint, Saint Tudno. 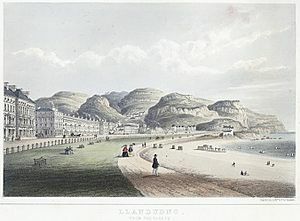 Llandudno, "Queen of the Welsh Resorts", a title first applied as early as 1864, is now the largest seaside resort in Wales. Historically a part of Caernarfonshire, Llandudno was formerly in the district of Aberconwy within Gwynedd. Mostly owned by Mostyn Estates. Home to several large herds of wild Kashmiri goats originally descended from several goats given by Queen Victoria to Lord Mostyn. 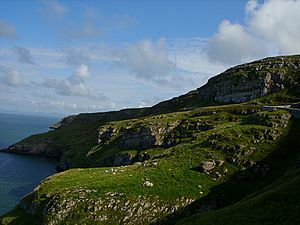 The summit of the Great Orme stands at 679 feet (207 m). The Summit Hotel, now a tourist attraction, was once the home of world middleweight champion boxer Randolph Turpin. This great limestone headland has many attractions including the Great Orme Tramway and the Llandudno Cable Car that takes tourists effortlessly to the summit. Modern Llandudno takes its name from the ancient parish of Saint Tudno but also encompasses several neighbouring townships and districts including Craig-y-Don, Llanrhos and Penrhyn Bay. Also nearby is the small town and marina of Deganwy and these last four are in the traditional parish of Llanrhos. The ancient geographical boundaries of the Llandudno area are complex. Although they are on the eastern side of the River Conwy (the natural boundary between north-west and north-east Wales), the ancient parishes of Llandudno, Llanrhos and Llangystennin (which includes Llandudno Junction) were in the medieval commote of Creuddyn in the Kingdom of Gwynedd, and afterwards part of Caernarfonshire. Today, Deganwy and Llandudno Junction are part of the town community of Conwy even though they are across the river and only linked to Conwy by a causeway and bridge. The award-winning pier is on the North Shore. Built in 1878, it is a Grade II listed building. 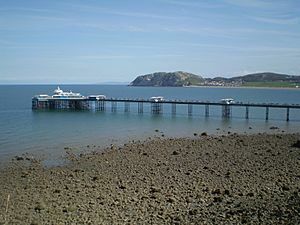 The pier was extended in 1884 in a landward direction along the side of what was the Baths Hotel (where the Grand Hotel now stands) to provide a new entrance with the Llandudno Pier Pavilion Theatre, thus increasing the pier's length to 2,295 feet (700 m): it is the longest pier in Wales. Attractions on the pier include a bar, a cafe, amusement arcades, children's fairground rides and an assortment of shops & kiosks. 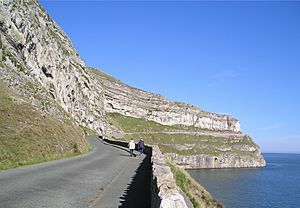 The first route round the perimeter of the Great Orme was a footpath constructed in 1858 by Reginald Cust, a trustee of the Mostyn Estate. In 1872 the Great Ormes Head Marine Drive Co. Ltd. was formed to turn the path into a carriage road. Following bankruptcy, a second company completed the road in 1878. The contractors for the scheme were Messrs Hughes, Morris, Davies, a consortium led by Richard Hughes of Madoc Street, Llandudno. The road was bought by Llandudno Urban District Council in 1897. The 4 miles (6.4 km) one way drive starts at the foot of the Happy Valley. After about 1.5 miles (2.4 km) a side road leads to St. Tudno's Church, the Great Orme Bronze Age Copper Mine and the summit of the Great Orme. 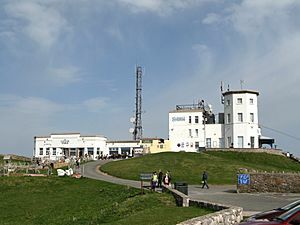 Continuing on the Marine Drive one passes the Great Orme Lighthouse (now a small hotel) and, shortly afterwards on the right, the Rest and Be Thankful Cafe and information centre. Below the Marine Drive at its western end is the site of the wartime Coast Artillery School (1940–1945) now a scheduled ancient monument. The West Shore is the quiet beach on the estuary of the River Conwy. 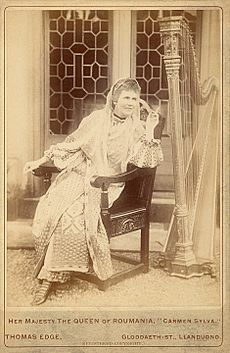 It was here at Pen Morfa that Alice Liddell (of Alice in Wonderland fame) spent the long summer holidays of her childhood from 1862 to 1871. There are a few hotels and quiet residential streets. The West Shore is linked to the North Shore by Gloddaeth Avenue and Gloddaeth Street, a wide dual carriageway. The North Wales Theatre, Arena and Conference Centre, built in 1994, extended in 2006 and renamed "Venue Cymru" is located near the centre of the promenade on Penrhyn Crescent. It is noted for its productions of opera, orchestral concerts, ballet, musical theatre, drama, circus, ice shows and pantomimes. Llandudno is unique within the United Kingdom in that its lifeboat station is located inland, allowing it to launch with equal facility from either the West Shore or the North Shore as needed. Llandudno's active volunteer crews are called out more than ever with the rapidly increasing numbers of small pleasure craft sailing in coastal waters. The Llandudno Lifeboat is normally on display on the promenade every Sunday and bank holiday Monday from May until October. In 2014 a planning application was submitted for a new Lifeboat station, with a larger boat, to be built close to the paddling pool on North Shore. The principal Christian Churches of Llandudno are members of Cytûn (churches together) and include the Church in Wales (Holy Trinity and also Saint Paul's at Craig-y-Don), the Roman Catholic Church of Our Lady Star of the Sea, Saint John's Methodist Church, Gloddaeth United Church (Presbyterian), Assemblies of God (Pentecostal), Llandudno Baptist Church, St. David's Methodist Church at Craig-y-Don, the Coptic Orthodox Church of Saint Mary and Saint Abasikhiron, and Eglwys Unedig Gymraeg Llandudno (the United Welsh Church of Llandudno). Matthew Arnold gives a vivid and lengthy description of 1860s Llandudno – and of the ancient tales of Taliesin and Maelgwn Gwynedd that are associated with the local landscape — in the first sections of the preface to On the Study of Celtic Literature (1867). The international art gallery, Oriel Mostyn, is in Vaughan Street next to the post office. It was built in 1901 to house the art collection of Lady Augusta Mostyn. It was requisitioned in 1914 for use as an army drill hall and later became a warehouse, before being returned to use as an art gallery in 1979. Following a major revamp the gallery was renamed simply 'Mostyn' in 2010. Llandudno Facts for Kids. Kiddle Encyclopedia.